Good morning Vietnam! 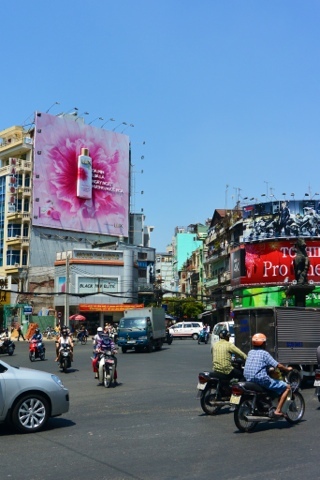 Well, it actually wasn’t such a good morning… we got off the bus from Cambodia in the middle of one of Vietnam’s busiest cities, groggy and disoriented. We carefully negotiated a deal with a taxi driver (after waving away most of the ones who had ambushed us when we got off the bus). All of a sudden, another driver grabbed our bags and practically ran. At first this didn’t seem too strange. Often, when at a bus stop or outside a popular tourist destination, there will be one driver who negotiates for a whole group, and will then send you off with one of his friends. We dutifully followed, hopped in the cab, and repeated our destination. Things started to get weird when he insisted we stop at an ATM to get out Vietnamese Dong (the local currency – aka VND) to pay him with. The man we had negotiated with had agreed to let us pay with US Dollars. I was completely out of cash, so I was the one to withdraw the necessary funds. Having no idea what the exchange rate was, I took out my handy-dandy iPhone app and discovered that the 2,000,000 VND I had withdrawn was a little over $100 Canadian. 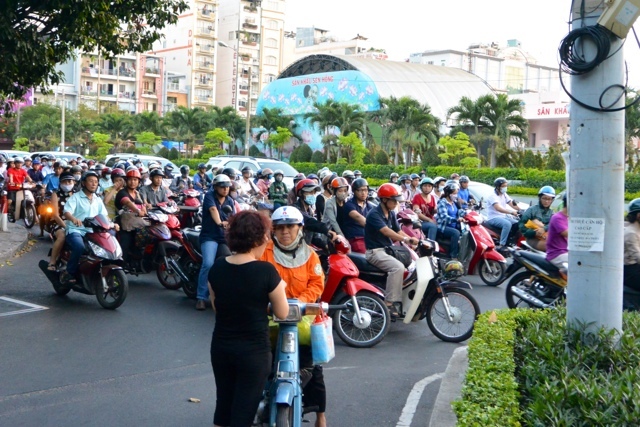 When it was time to get out of the cab, the metre read 700,000 VND. For a 5 minute cab ride in Vietnam, that could not have been right… $40 CDN? No way. We asked someone on the street if that was an appropriate amount for a taxi. A kind looking Vietnamese man helped us out, “No! You got robbed! Get your money back!” Thankfully Beth hadn’t gotten out of the cab yet, and the helpful man started to berate the driver in Vietnamese, so we got all the money back except for about 7,000 VND (less than a dollar). After a pretty exciting start to the day, we found our hostel (Budget Hostel 2) which was under construction… We were told to walk straight through and under the scaffolding! We came upon an 18 bed dorm which was thankfully barely half full. The rest of the day we spent wandering the city and getting to know our surroundings. 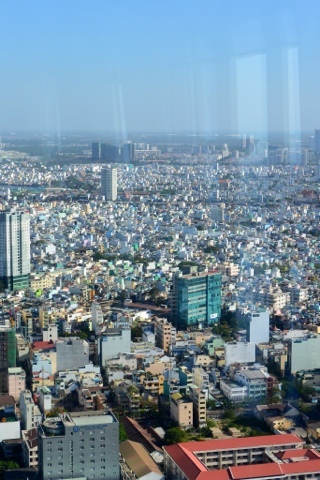 Ho Chi Minh is big and busy! I was amazed but how active the city’s inhabitants are – during the evening the parks are full of people playing soccer, exercising on the public machines, and playing a version of hacky-sack that involves something resembling a badminton birdie! We gave the excercise machines a try…. Which the local ladies found very humorous. We didn’t think that was entirely fair, given that they were doing the same thing as us, but wearing full pyjama sets as clothes! 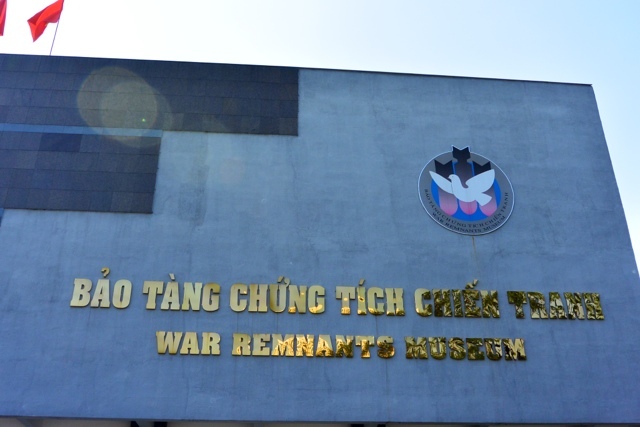 The next day we visited the War Remnants Museum. 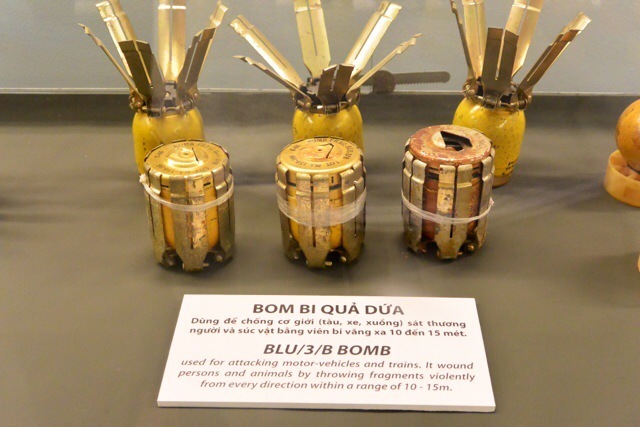 The museum provides a look at the Vietnam War from the Vietnamese perspective. 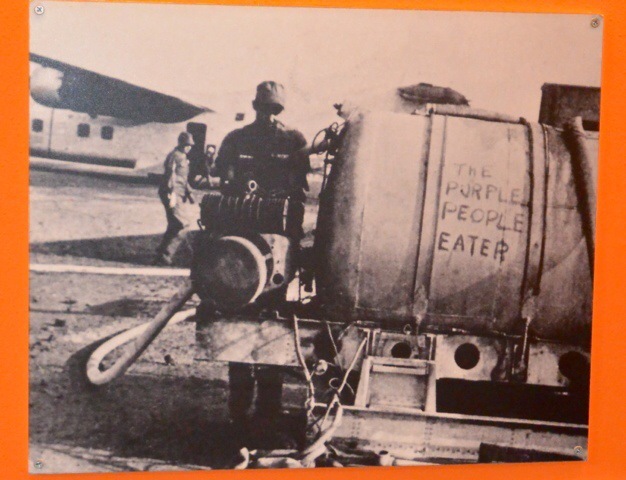 While a bit heavy on the Agent Orange propaganda (there are so many photos of those affected that you can’t help but think these people are a bit exploited), the museum is quite interesting overall and well worth a visit. A tip: start your visit from the top floor and work your way down, it will make much more sense chronologically. The section at the top provides a decent overview of the politics of the war, and sets the stage for a greater understanding of the information to follow. 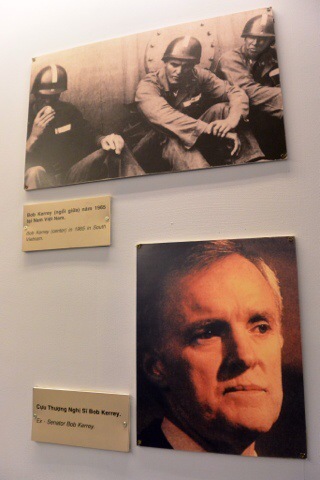 One aspect of the information that sparked a lot of reflection for me was the reminder that many American political leaders were involved in the Vietnam War, some of whom committed truly terrible war crimes. What does it aha about a nation when such atrocities go unpunished, and those individuals are elected to government? 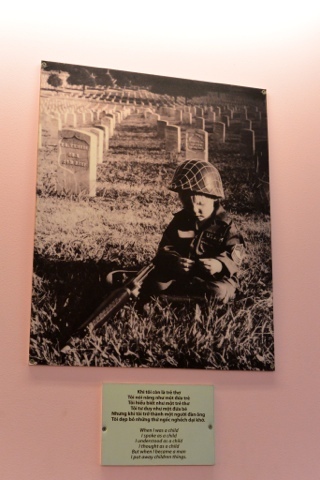 My favourite part of the displays was the room featuring information about the photojournalists who worked during the Vietnam War. 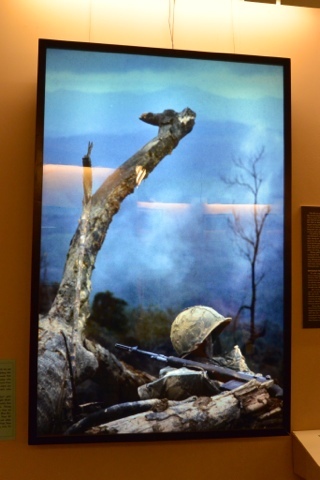 As this war was one of the first to be documented in such detail, it was really interesting to learn more about the people who made that happen, as they really shaped the world's understanding of what was going on. 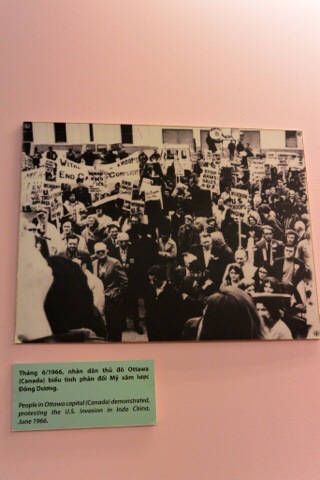 The Vietnam War is somewhat defined by the protests and anti-war movements it sparked, which in turn came to define the 1960s. 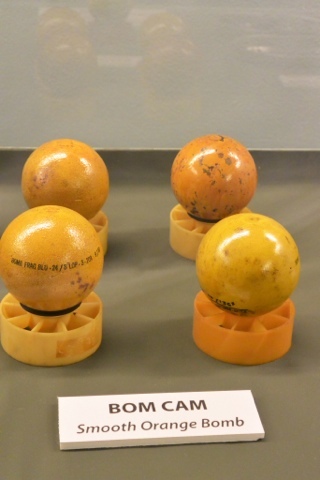 The museum also provides a global perspective on that time in history. We left feeling educated, enlightened, and also quite somber. 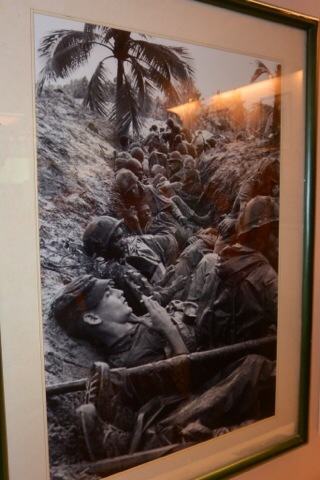 Similar feelings were washing over me as when we had visited the Killing Fields in Cambodia. I’m glad I’ve had the opportunities to learn about aspects of Southeast Asian politics and history while I’ve been traveling. 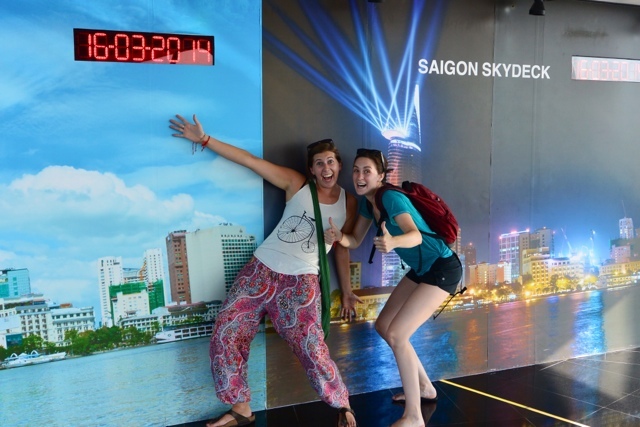 In addition to the historical visits, we did lighten the mood and take advantage of all Ho Chi Minh had to offer. 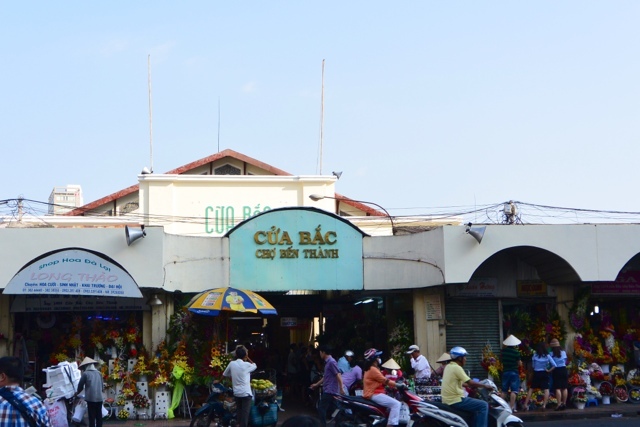 A visit to the Cua Bac/Cho Ben Thanh Market was fruitful, resulting in the purchase of many souvenirs (which we can look forward to seeing at home in about 3 months when they finally arrive by ship!) The market is bursting at the seams, stocked with clothing, chopsticks, coffee, tea, and endless souvenirs. From there we wandered around looking for some fun. We enjoyed some time at a rooftop bar, sampling cocktails and Bia Saigon! 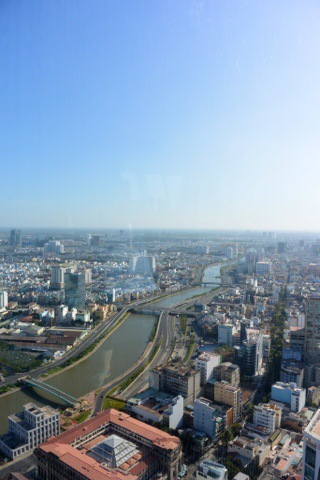 This city is bustling and stays awake for a long time. We managed to get late-night snacks at a French bakery! On our final day in the city we spent the morning doing a much needed bag clean-out. Jacquie had been wanting to send things home since we had met up in Cambodia, and our trip to the market the previous day made sending stuff home a necessity. This took up most of the morning… Which had been slow given our activities the night before. After stopping at the post office, we grabbed a very quick bite to eat (seriously… We hadn’t eaten all day so we inhaled our food. I think the waitress thought we were animals). 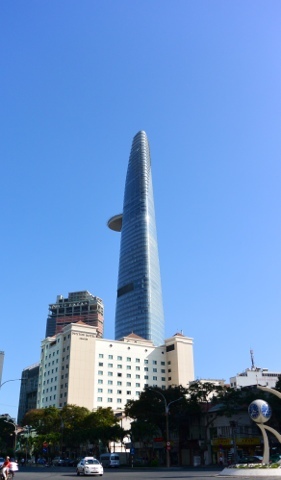 Our final stop of the day was the Bitexco Financial Tower, the iconic building of Ho Chi Minh, which boasts amazing views of the surrounding city. My lovely travel-mates showcased their silly sides… Oh how I love them! 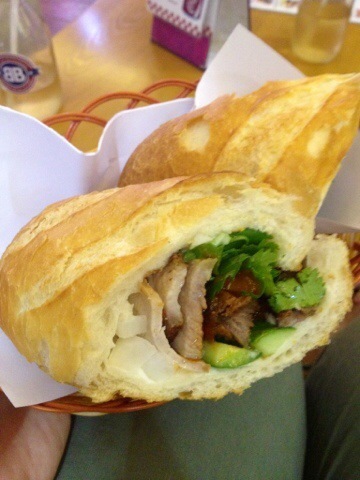 Our dinners each night in Ho Chi Minh consisted of Bahn Mi, a fantastic sandwich that combines baguette, some sort of meat filling, cucumber and carrot slaw, and really tasty sauce. They also bring you an ice-cold iced tea on the house! Such a nice touch for a place that sells sandwiches for a dollar. 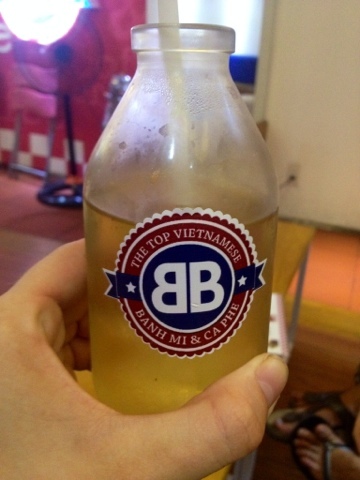 We literally went back to BB Bahn Mi every night! They loved us by the end. Jacquie went back just before we got on our bus to Mui Ne to get sandwiches for the road, and they asked her where her friends were! 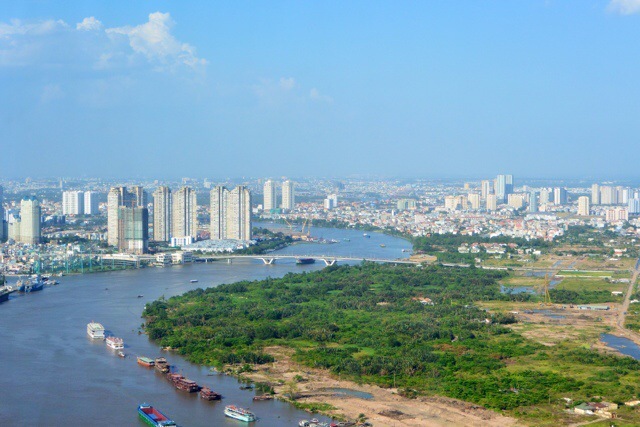 Out of all the cities we have visited, I’ve decided that Ho Chi Minh is one I could actually live in. It’s a great city, easy to navigate by foot (despite the droves of motorbikes, pictured below) with plenty of access to everything you need! Not to mention there is Bahn Mi… But in all seriousness, I admire the city’s commitment to cleanliness and most of all it’s very active population! Also… Please note I am no longer even close to blogging in real time with my trip. I’m actually in Laos now, trying to play catch-up! ← Mui Ne: Sand Dunes & St. Patrick’s Day!